Wet head is a fun water roulette game suitable for ages 6 years and over. Its the perfect game now that the weather is much nicer. The game is pretty simple all you need to do is fill up the water tank, strap the hat on securely to your head, spin the top and pull one of the pins. 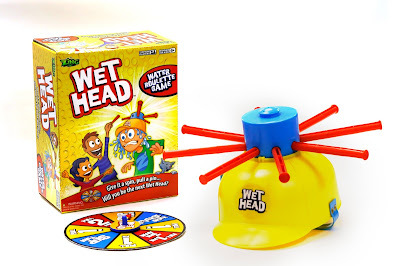 The aim of the game is each player has a turn at wearing the hat until the 'trigger' pin is pulled which causes the tank to release the water onto the head of its anxious player. Now Two of you lucky readers have a chance to win the game. So want to try this game! My favourite game is tennis. We love to play rounders and get the whole family involved! We like playing swingball outdoors. the girls love playing swingball! My kids love playing swing ball in the garden!!!! !